Saudi Arabia’s move to isolate Iran raises the specter of deepening conflicts in the volatile Middle East after the biggest meltdown in relations between the two regional powers in almost three decades. The Saudi government and staunch ally Bahrain severed diplomatic ties, giving Iranian ambassadors 48 hours to leave after protesters set the Saudi embassy in Tehran on fire over the weekend following the execution of Saudi cleric Nimr al-Nimr, a critic of the kingdom’s treatment of its Shiite minority. The United Arab Emirates reduced its representation to the level of charge d’affaires. The clash exposes again the fault lines in the world’s tinderbox and risks worsening conflicts in Yemen and Syria, where Sunni-dominated Saudi Arabia and Shiite Iran are fighting proxy wars. The widening rift follows Saudi criticism of the U.S.-led deal last year over Iran’s nuclear program. It also comes as the collapse in the oil price strains domestic finances in a region that accounts for more than half of global reserves. "The temperature right now is rising and I’m not sure we are seeing the end of escalation of tensions here," Robert Jordan, a former U.S. ambassador to Saudi, said in an interview with Bloomberg Television. Countries including Germany and Italy urged the two powers to avoid raising the stakes. German government spokesman Steffen Seibert said in Berlin that the “door of diplomacy” should remain open and urged the countries to renew ties. The oil price rose, while stock markets in China, Japan and across Europe tumbled on the first full trading day of 2016. While concern was mainly about the Chinese economy, the prospect of more strains in the Middle East initially contributed to the turmoil. Oil futures at one point were up more than 3 percent in London to $38.50 before retreating. Saudi Foreign Minister Adel al-Jubeir said late Sunday that his people would no longer deal with “a country that supports terrorism and sectarianism.” In an interview with Reuters on Monday, he said Saudi Arabia will cut air traffic with Iran, end commercial relations and stop its citizens from traveling to the Islamic republic. The sentiment was echoed by Bahrain, which accused Iran of funding, supporting and arming extremists and inciting strife in the region. There had been scattered protests by demonstrators in the majority Shiite nation after al-Nimr’s execution. The U.A.E. also accused Iran of unprecedented and “continuous interference in the internal affairs or Gulf and Arab states,” according to the official WAM news agency. Kuwait said it backed “all measures adopted by Saudi Arabia to maintain its security and stability,” according to an unnamed Foreign Ministry official cited by the KUNA state news agency. Iranian Supreme Leader Ayatollah Ali Khamenei had said earlier that Saudi rulers would face repercussions for the execution of the Shiite cleric and that “the divine hand of revenge will take the Saudi politicians by the throat.” Iranian-backed Lebanese group Hezbollah accused the Saudi royal family of killing al-Nimr. 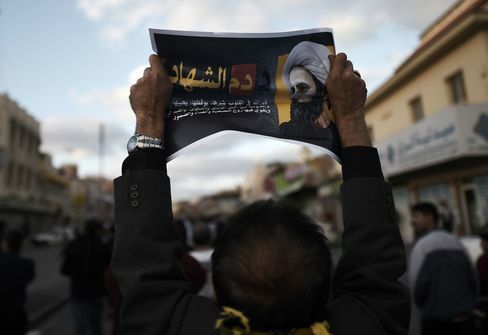 A protestor holds a poster bearing a portrait of cleric Nimr al-Nimr during a demonstration against his execution in the village of Jidhafs, west of Bahrain's capital Manama on Jan. 3, 2016. The standoff between Iran and Saudi Arabia is the biggest between the regional powers since the late 1980s, when the kingdom suspended ties with Iran after its embassy was attacked following the death of Iranian pilgrims during Hajj in Mecca. Saudi Arabia also supported Saddam Hussein’s Iraq against Iran during the first Gulf War. The latest clash probably will undermine already-stumbling efforts to end the war in Syria, where Saudi Arabia backs largely Sunni militants and Iran supports the regime of President Bashar al-Assad. The showdowns -- verbal or other -- didn’t halt a protracted slide in oil prices last year amid a global supply glut. Brent crude prices fell for a third year in 2015, tumbling 35 percent. Saudi Arabia is the biggest member by output in the Organization of Petroleum Exporting Countries, while Iran is the fifth-largest in the group. The latest crisis may cause a short-term price spike of $1 to $3 a barrel in an oversupplied market, said John Auers, executive vice president at Turner, Mason & Co. in Dallas. He said he doubts it will change Saudi Arabia’s longer-term position of overproducing crude to depress global prices, harming Iran as it moves to increase its own output even while forcing a cut in public spending at home.